Since he won the election and became arguably one of the most scandal-ridden presidents since Richard Nixon, room rates are falling at Donald Trump’s five-star SoHo hotel in New York City, and up to 15 percent of the housekeeping staff may lose their jobs. According to radio station WNYC, which combed the hotel’s financial documents, since January the hotel’s conference and event bookings have dropped by almost two-thirds. 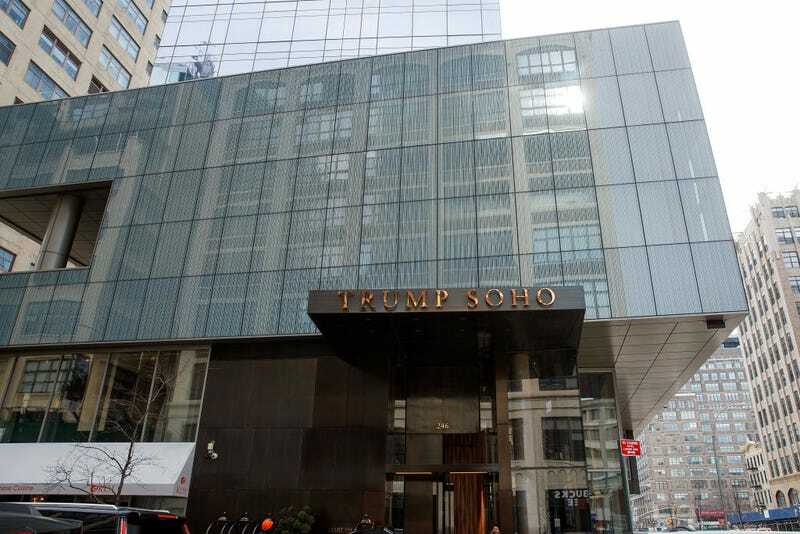 The radio station notes that you can find Trump SoHo rooms for less than $400 a night, hundreds less than other five-star hotels in that area of downtown Manhattan. At this time last year, the hotel had booked some 29 large corporate events; that number has dwindled all the way down to 11 this year. “That sounds to me like a financially troubled hotel,” Jan de Roos, a professor at the Cornell Hotel School, told the radio station. De Roos also told the radio station that while the hotel can try to cut costs, that won’t solve the bigger problem: the name on the marquee. “I have to believe that a lot of organizations would not want to have meetings at a Trump Hotel, just to not have to deal with it,” he said. While the SoHo property might not be raking in the bucks it used to, the Associated Press reports that the Trump International Hotel in Washington, D.C.., “has become the place to see, be seen, drink, network,” and room rates are rising. Read more at WNYC and the Associated Press.